Marble is a classic material that has been the choice of artists and architects, princes and kings, for thousands of years. Its mere presence is a statement of refinesment and sophistication. Onyx, is a type of marble that takes this sophistication to the next level, with a wide variety of passionate colors ripping through the smooth polished surface of the stone, creating awesome patterns of contrast and color which are unique and one of a kind in each and every piece. Dark midnight with shades of sea green, is broken by fierce bursts of white energy. The result is a tempestuous piece, almost crackling with power, solid, polished, perfect, with just a hint of a wild side to invigorate your space. These vases will truly make an impressive statement in any environment where you choose to place them on display. 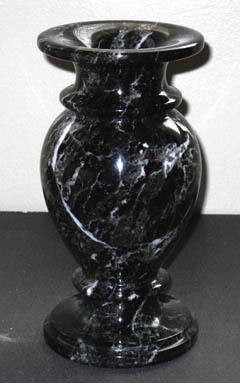 A smaller bud vase version of the piece above, this decorative accessory has the same powerful contrast of dark midnight black, broken and empowered by the arcs of white lightning, which gives the whole piece a sense of energy. 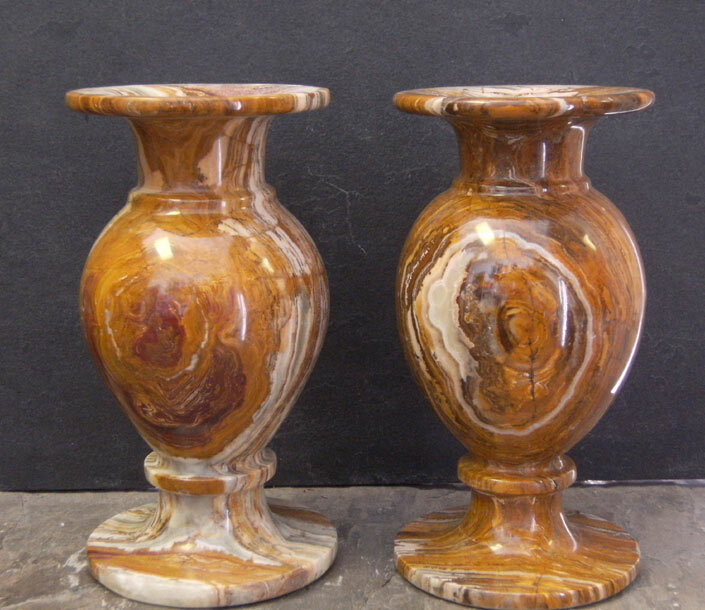 The marble itself is an exotic asian material, that is quarried from deep beneath the earth, and then shaped, carved, refined, and finally polished to the smooth perfection you see here. 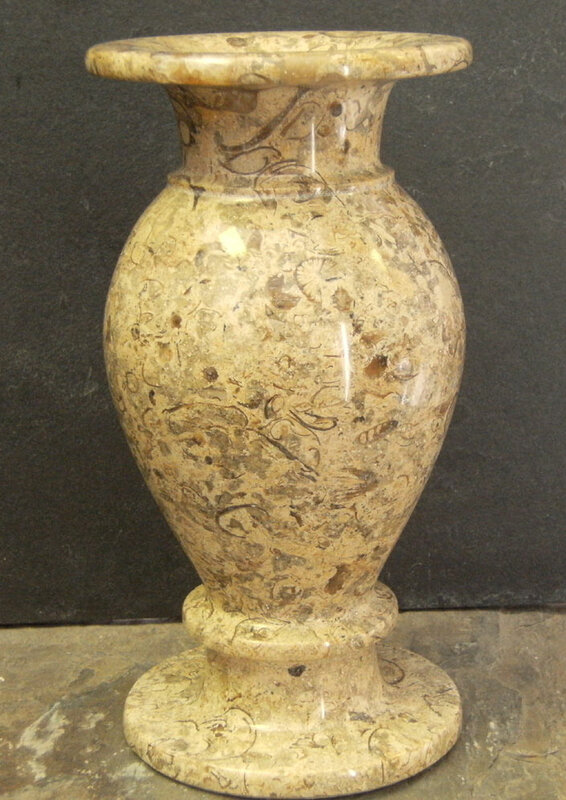 A startling piece of one of a kind home decor, that can be making a statement in your home right now. A brilliant multi-colored display, a vision of raw chaos trapped beneath perfect shimmering perfection. 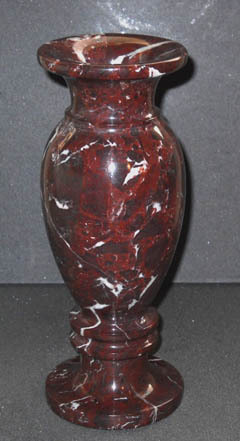 Crimson tones run deep into the perfect marble, while white wisps crackle with potential energy. The result is a tempestuous storm of rage and fury, trapped in an eternal never ending scene of delight and wonder. All available as the display backdrop to a lovely flower. 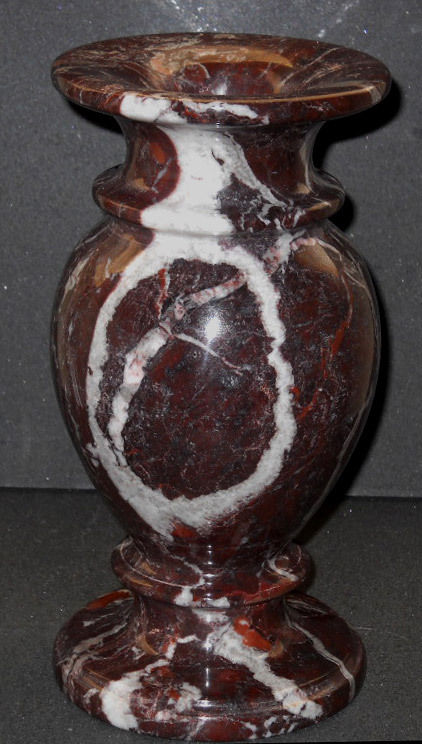 One of a kind natural stone decor, with a guarantee that your piece will be unlike any other in the entire world. A broad crest and a broad belly, makes this decorative marble vase an imposing piece on any environment. Crafted from high quality imported, natural marble from Asia, this piece is a stunning vision of the potential that can be found when human design merges with natural art. An instant focal point, raging with intense powers and fierce energies, all swirling beneath a polished marble perfection. Passion, a great emotional surge which welled up from the belly of the earth itself, then mingled and bubbled, and concocted for a million years, until valiant workers were able to free the earth child from its stony womb. From there its rough exterior was worked, chisseled, carved, and polished, until it became the seamless perfection you see here. A shimmering glistening example of the raw and intense beauty of nature, when melded with the wit and craft of human hands. A magical dance between humanity and the earth itself, played out in contrasting tones in the surface of these unique, individual, and flawlessly chaotic pieces. 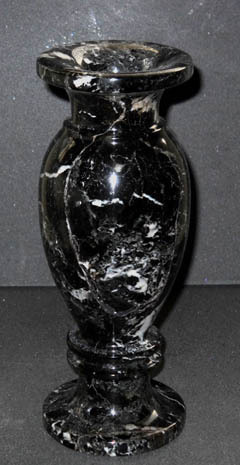 A marble vase is a hallmark of classic sophistication. 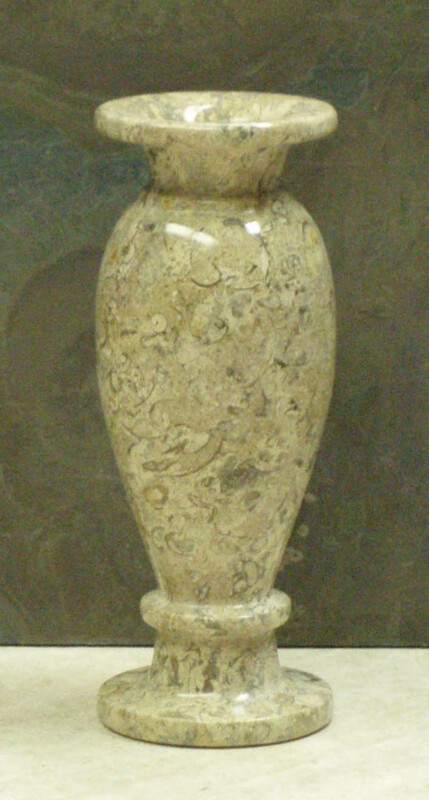 Here we see a vase crafted from fossil stone marble, a unique material that actually contains the real, fossilized imprints of ancient creatures, right in the surface of the stone. These imprints include plants, tiny organisms, shells, leaves, and even pieces of flowers, all of which can be clearly discerned with a closer inspection of the piece. 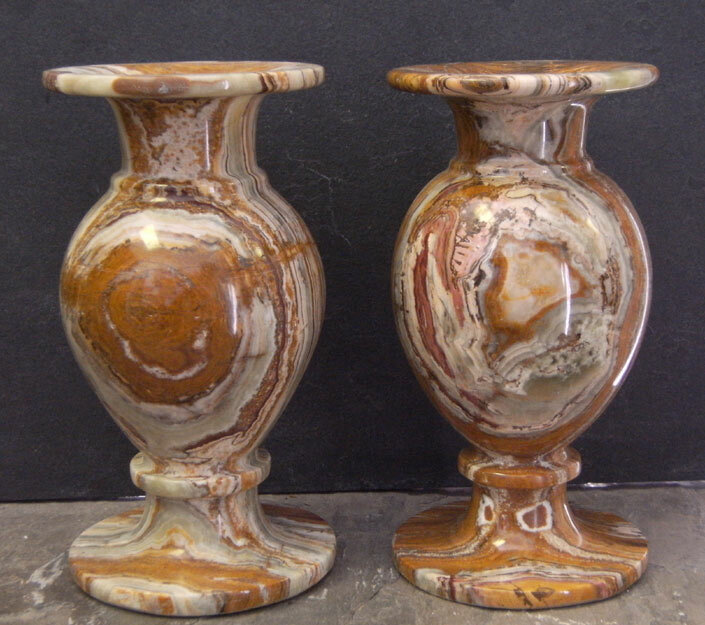 Fossilized imprints, like echoes from the ancient past, dot the surface of these elegant marble vases. Each print, a shell, a leaf, a tiny plant, is the story of lifes struggle, the great evolutionary road that has wound its way through time and in so doing, has left its mark forever in the unchangi9ng surface of these solid, intense, beautiful marble pieces. And they have done so in a unique way, with a one of a kind pattern adorning every single marble vase.